You can hardly call this a recipe since it more of a brunch or lunch idea that I often resort to especially during summers since its simple, quick and easy. Sometimes I use left overs of vegetable stir fries (especially okra or eggplant) as sandwich fillings and today, I wanted to finish the left over mutton kheema and what best way than make a sandwich with minimum preparation work. Absolutely impressive in taste, this simple comfort food certainly made my day. :) Its quite filling and best suited for brunch or lunch. Try it and you will be receiving accolades from those who have a bite of this kheema sandwich. Heat one and half tbsps of oil in a pressure cooker. Add half a cup of chopped onions and saute till transparent. Add a tsp of ginger garlic paste and saute further for another 3 mts. Add 1/4 kg washed kheema and cook for 7-8 mts on high heat, stir once in while. Add 1 tsp red chilli pwd, 1 tsp coriander pwd, 1/4 tsp garam masala pwd and salt to taste. Combine well. Add half a cup of water and pressure cook till the kheema is completely cooked and soft. This could take about 15-20 mts. Turn off heat. Kheema is supposed to be semi dry, and can be cooked further without lid till there is no water content. 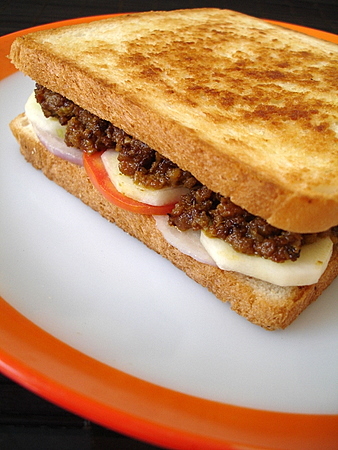 Toasted bread, slices of onion, tomato, cucumber, capsicum and kheema. Pretty simple affair, just layer toasted bread with slices of tomatoes, onions and cucumber, a generous amount of the kheema, layer of capsicum rings and finally top with toasted bread and your meal is ready. I used white bread though both brown and ragi bread work fine. My entry to the Sandwich festival, a food event started by Anupama of Food-n-More. Liked Poha dosa, will be trying that soon. That’s one gorgeous sandwich. That Kheema peeping out of the sandwich looks soooo good. Thanks so much for this lovely entry. See you at the round-up. Wow. now that’s a perfect sandwich. I made a pepper chicken sandwich which my son loves. I bet he would love this. This looks very appetizing! Great idea for a sandwich! yummy sandwich!! !i dont eat mutton but that wont stop me from eating this. will definitely try this with minced chicken…great entry!! Oh that looks so good!Yum! Hai Sailu, i’m punitha. Doing a good job…… Please keep it up…..
great sandwich sailu, saw the pic of ur sandwich in the roundup and just cudnt help myself from checking it out and commenting!!! great job! what a brillant way to put all together!! oh, great idea! but instead of going for bread, we can make franky, even for a change. this tastes awesome, I have tried it with the keema that ma prepares.. on the same lines, can try the same trick with rajma also. A generous dash of ketchup works well on the rajma sandwich..